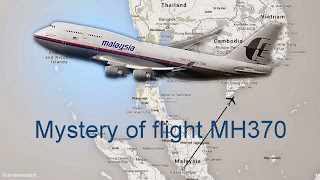 Mystery still surrounds the disappearance of flight MH370, a Boeing 777-200ER which went missing last Saturday [8/3/2014]. Flight MH370 had departed from Kuala Lumpur International Airport in Malaysia at 00:41 on Saturday local time [16:41 GMT Friday], and was due to arrive in Beijing at 06:30. But Air traffic controllers lost contact at 01:30, less than an hour into its flight. Malaysian officials said that the last verbal communication with the plane came at the boundary between Malaysian and Vietnamese airspace. Malaysia's air traffic control informed the pilot that the flight was about to fly into Vietnamese airspace and told them to contact Ho Chi Minh control. "OK, roger that", was the last radio transmission. Soon after the aircraft’s transponder went off and there were no further communications from the aircraft. There have been countless theories as to what became of the plane with a strong focus on terrorism, a catastrophic structural failure or even pilot suicide. Concerns were doubly raised when it was revealed that two passengers had boarded using stolen passports [Telegraph]. Later identified as two Iranians, Delvar Suyed Mohammad Reza & Pouria Nour Mohammad Mehrdad, their involvement in foul play was discounted since both individuals had arranged to meet up with relatives in Frankfurt, Germany. Nonetheless some government agencies, including the CIA, said they had still not ruled out terrorism. Indeed there is some concern that coming on the heels of a terror attack in Kunming, Yunnan, China, only a week earlier, the disappearance of flight MH370 might have been a terror attack perpetrated by Uyghur separatists. There is certainly anecdotal evidence supporting such theories. China has claimed several times to have thwarted terror attacks aimed at bringing down planes. In June 2012 passengers subdued a person who tried to gain access to the cockpit of Tianjin Airlines Flight 7554 which was travelling between Hotan Airport to Urumqi, the regional capital of Xinjiang of Urumqi [ABC]. In 2008 Chinese state news agencies reported that a China Southern Airlines plane was forced to land because "some people were attempting to create an air disaster." The flight had taken off from Urumqi, the capital of the Xinjiang Uyghur Autonomous Region, and militants had attempted to hijack the plane but were foiled by the flight crew, according to officials. [CNN / LA Times]. Malaysia forcibly returned at least 11 Uyghurs on 6th August 2011. On the same day, the Thai government turned over an ethnic Uyghur, Nur Muhammed, to Chinese diplomats in Bangkok. And on 8th August, Pakistan deported five blindfolded and handcuffed Uyghurs, including a woman and two children, to China, media reports said. It is unclear whether these individuals had any connection to separatist activities, but such deportations certainly raise the finger of suspicion. One main theory is that there was a catastrophic failure of the aircraft. An FAA [Federal Aviation Administration] had earlier approved an order asking that hundreds of 777s be checked for cracks and corrosion issues. The concern was that should these problems go undetected, they could potentially lead to decompression problems or a "loss of structural integrity of a plane", essentially resulting in a break-up mid-air [CNN]. A sudden depression in the cabin could have resulted in the pilots falling unconscious sending the plane well beyond the current search zone as it flew on autopilot before running out of fuel. Malaysian authorities dismissed such possibilities saying the aircraft had been inspected in February and given an all-clear. The FAA warning also seemed to reject this possibility. The warning related to the fuselage skin underneath an adapter for the airplane's satellite communications antenna something that was not fitted on the 777-200ER Malaysia Airlines aircraft, and as such was not subject to the FAA order, Boeing said [Reuters]. Another theory being discussed is pilot suicide, and there were suggestions that authorities had begun to investigate the backgrounds of the crew. However Malaysian officials denied they had searched the homes of the pilots. Meanwhile, police sources said they had questioned the pilot’s family and were investigating if there were any underlying mental or psychological issues [News.com.au / Daily Mail]. There has been much criticism, especially from China, concerning the information coming from Malaysian officials. Information has been sketchy, confused and contradictory at best. There have been reports the plane turned back and that military radar had tracked the aircraft to the Malacca Strait, hundreds of kilometres to the west of its last reported position. But these reports were later quashed by another military spokesperson [NBC]. The confusion has resulted in searches being conducted in areas that may not have been necessary. But Malaysian authorities have defended their efforts. “This is a crisis situation... and a complex situation,” a spokesman said Thursday before adding, “We have not done anything to jeopardize this search effort”. That search effort has been extensive and involved many nations. Much of the search has been conducted conventionally with the use of planes, boats and helicopters. Several nations have sent warships and aircraft to the areas where flight MH370 may have gone down but some 6 days after the plane disappeared there has been no sign of wreckage. However there are many who believe that the search has been hindered by imprecise, incomplete, and sometimes inaccurate information which have raised doubts about the aircraft's possible location and trajectory. The searches have also stretched to hi-tech methods. On Wednesday China released satellite images taken on Sunday morning, a full 24 hours after the Malaysian flight disappeared. However, soon after the pictures were posted to the State Administration for Science, Technology and Industry for National Defence (SASTIND) website, the portal became inaccessible for several hours. Meanwhile news stations poured over the images and debated their veracity, the poor image quality and timing of their release. There were questions over whether the images truly showed wreckage of the missing Boeing 777-200ER. Given the dimensions of the supposed debris some commentators on CNN were sceptical that the images showed parts of an aircraft at all. The estimated size of one piece was 24 metres by 22 metres, too large to be a part of the plane. There was also a debate over why it had taken more than three days for the Chinese to release the images and a discussion as to why the images were so fuzzy. There was some suggestion that the photographs had been deliberately doctored in order to hide China’s satellite capabilities. There was a sense that the position of the supposed debris was correct given the last reported position of the aircraft and the prevailing currents. However, by Thursday China said they had released the images by mistake [BBC]. Furthermore, a search in the area concerned proved fruitless. There have also been crowd-sourced searches for the missing plane. Digital Globe, a commercial vendor of space imagery, set up a portal through which Internet users could browse through satellite photographs and mark objects which might show signs of the aircraft [Telegraph]. As well as satellites even the International Space Station has been employed, training cameras on the region, though sifting through all these images can take hundreds of man-hours and even then one could miss any potential evidence. While the cause of the disappearance of flight MH370 has yet to be established, the incident should serve as a wake-up call on a number of levels. In respect to security, there has been a major failure in allowing two individuals to board the plane using stolen documents. These two men should have been stopped and apprehended upon their arrival at Kuala Lumpur airport. However, Malaysia failed to check the passports against a list maintained by Interpol. The number of names is significant, more than 39 million according to Interpol themselves. But the organisation said only a handful of nations, amongst them the UK, USA and UAE, bother even to check names and numbers on a routine basis. Another concern is the issue surrounding flight data. The main problem surrounding the search for flight MH370 has been determining where it might have gone down. The problem might well have been made much easier should a constant stream of telemetry be broadcast as routine from international flights. While some modern aeroplanes are fitted with such equipment it is not mandatory. There also needs to be better coordination between different agencies and countries. There have been several erroneous reports concerning what was transmitted from the aircraft and where it was last spotted either by its transponder or radar. Indeed this has led to confusion which may well have impeded search efforts. Almost forgotten in the fog of disinformation are the passengers of flight MH370. There were 227 passengers, including 153 Chinese and 38 Malaysians, according to the manifest. Seven were children. All 12 crew members were Malaysian. Families have expressed frustration at not receiving enough information and there have been angry scenes at daily press conferences in Beijing where relatives of the 153 Chinese on board the stricken plane have gathered. In Australia too there have been criticisms coming from family members of seven passengers aboard the plane. The pain and anguish is likely to continue until evidence concerning the whereabouts of the Malaysian aircraft emerges. Like Air France flight 447 it could take months if not years to find out what happened to the ill-fated flight of Malaysian Airline flight MH370 [BBC]. This delay and the not knowing will only make it harder for those who have lost their loved ones.